Ducati Custom V4 Streetfighter With Rumors Of More? 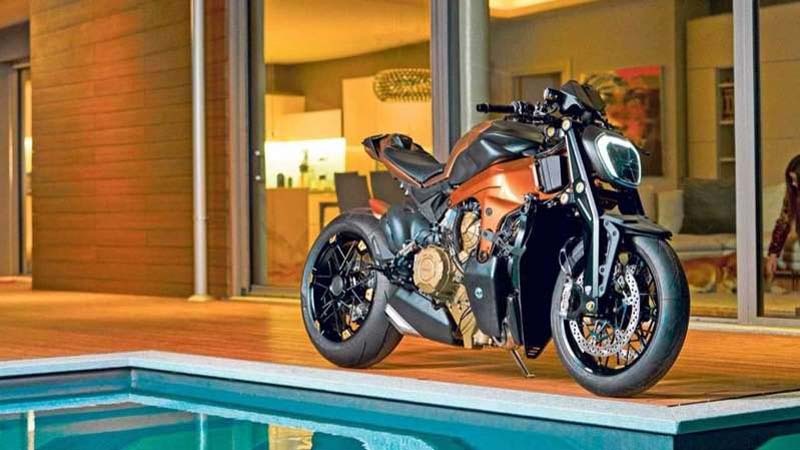 Custom naked Panigale might be a sign of things to come. 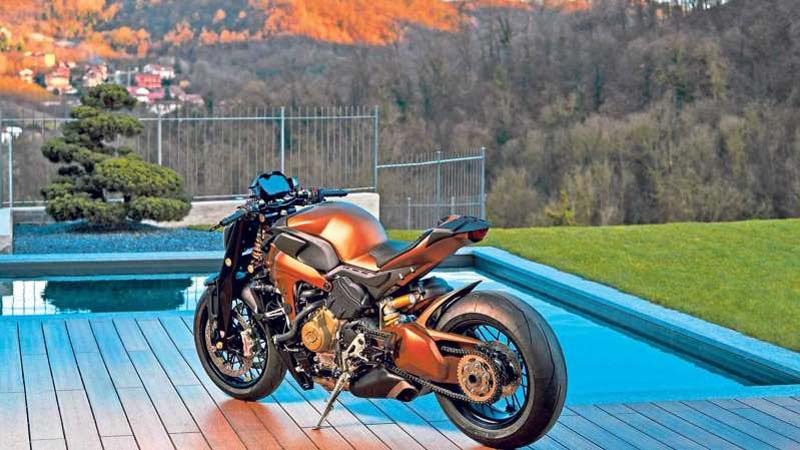 When I first saw this headline, I thought Ducati itself had created a Panigale-platform streetfighter and, well, let’s just say I needed a moment alone. Alas! Not so! The Panigale is a gorgeous thing. Here, Officine GP Design has souped it up slightly (I KNOW!) and taken all its clothes off. This is a custom machine and they’re creating a run of only ten (10) of them. But wait! All is not lost, since Ducati has been hinting at a bit more model diversity on that V4 platform and a streetfighter a-la a super Diavel, or, remember the 1098? That might just be the way to go. 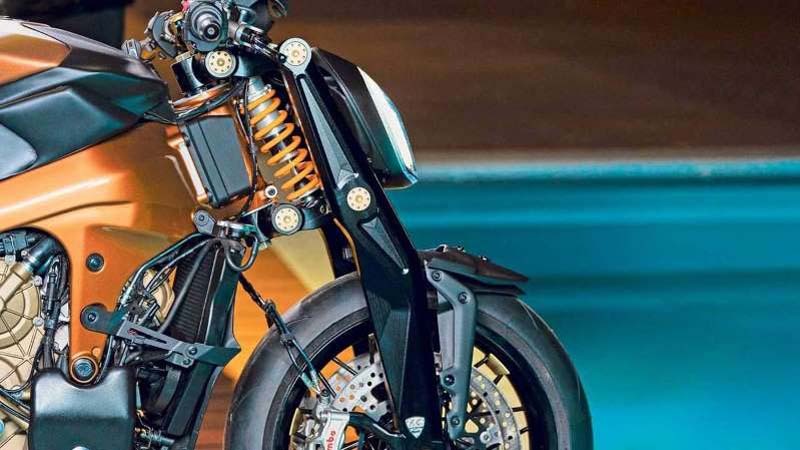 A factory V4 streetfighter probably won’t have that girder fork/Ohlins shock front setup, or the Jonich SX custom spoked (tubeless applicable) wheels. Would it keep the tank or redesign it into something a little more naked-friendly? This front tank/frame setup, while the custom work strips it of its plastics, it has left behind too many of those little brackets the fairing pieces used to hang from. That that front fairing v-piece behind the wheel remains, ostensibly to protect the radiator, but hovers, clinging to brackets, bein’ ugly, on what is otherwise a real stunner of a machine. The custom shop yanked headlights off Diavels and fitted them to these Panigales, kept the dash configurations but fabbed brackets to make them work without the front subfairing. They have custom logo’d leather seats by Foglizzo, and Rizoma supplied the levers, footpegs, fuel caps. Faaaaaaancy. Claudio Domenicali, the CEO of Ducati, has promised us all more bikes with this V4 engine, hopefully situated in bikes that aren’t so fully-faired, so that we can see it! He said, “We will release 29 new models over the next five years. We will continue to develop new versions of existing products but will also be entering segments that we are not currently in. As part of that, we will use the V4 engine in different platforms.” Here’s some more inspiration: Ducati holds the current record at the Pikes Peak hillclimb. Pikes Peak bike setup rules stipulate no fairings, and handlebars not clipons. They’ve named a model after it (OK, I know, a Multistrada but still). Carlin Dunne, who will be riding Ducati at the 2019 event, is registered on the start list as riding the “2019 Ducati TBD.” The mind reels. Until we know (and the new V4 bikes go into production), if you want to purchase one of these ten custom V4 streetfighters, it will cost you not-quite $114,000 (US). Plus tax, no doubt. Is cheap gas good for your car? Autos - U.S. Daily News: Ducati Custom V4 Streetfighter With Rumors Of More?